[SatNews] Smith Micro Software, Inc. (NASDAQ: SMSI) and Option (EURONEXT: OPTI) (OTC: OPNVY) have announced a partnership to enhance machine-to-machine (M2M) and mobile hotspot environments with intelligent remote policy management and value-add content delivery. Through this partnership, Smith Micro's NetWise® solution will be integrated with Option's CloudGate M2M gateway, with a demonstration planned for Mobile World Congress in Barcelona. 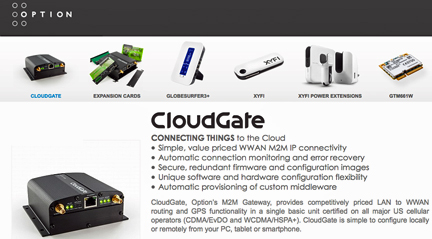 CloudGate is an M2M Gateway solution for LAN to WWAN routing that includes an open M2M application development environment and a cloud-based provisioning service all in a single base unit. It meets all the market requirements for a robust, secure, expandable, and feature rich routing platform that will provide the reliability customers need in the field. NetWise is an intelligent, policy-on-device platform that provides carrier-grade management and control over mobile devices to reduce support costs and accelerate time to market for M2M solutions. NetWise uses standard protocols, such as OMA-DM from the Open Mobile Alliance, to implement policy-based device and application configuration, intelligent network selection, and data efficient firmware and software updates to mobile devices. Option and Smith Micro will collaborate on mobile M2M initiatives such as Industrial Telematics, Retail Location Based Systems, and Fleet/Asset Tracking. 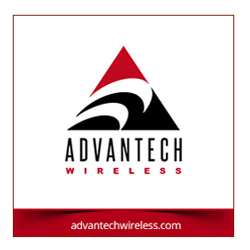 In addition, the companies will work together on general connectivity use cases, such as in-vehicle Wi-Fi hotspot management, where user entitlement and content can be dynamically managed via a captive portal based on location, user credentials, and a variety of network and device conditions. A demonstration of the integrated CloudGate and NetWise technologies will be shown at Mobile World Congress, on February 26, at the OMA showcase from 3:00 to 7:00 p.m. in Hall 8, Theatre D, of the Fira Gran Via, Barcelona, Spain.